It's been a tumultuous year for some of New York's most fashionable young ladies. To hide her delicate condition, Elizabeth Holland has married her father's business partner for security and protection from scandal. Her sister Diana has cut her hair and quit New York to go after her love, Henry, who was forced into an unhappy marriage with the duplicitous Penelope Hayes. Meanwhile, Carolina Broad is steadily moving towards her happily ever after...if the truth about her humble origins can stay hidden. But if there's anything that these ladies have learned, it’s that life doesn't go the way you plan, and getting everything you wanted isn't the same thing as happily ever after. 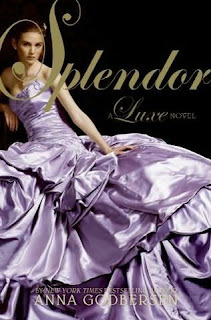 Like Godbersen's previous books, Splendor has glamour, drama, and intrigue, but really feels more like an extended conclusion than an actual story. Elizabeth seems to take a more passive role in the book, and compared to her previous escapades, her journey from learning the truth about her husband's death and her current marriage to when she actually takes control of her own life is a little anti-climatic. Readers who love to hate Penelope will be indignant at her behavior but will be happy to see her finally get what's coming to her, even if her fate isn't at all what they expected. Lina struggles with the truth, but readers will be pleased when she finally succumbs to it and reconciles with her sister. Her happy ending is also unexpected, but a good one. Diana continues to stand out in this book as an adventurous, smart, and fiercely independent young lady. She's truly a woman of a new era, unyielding when it comes to her ideals and strong when it comes to life's challenges. Splendor is a novel about growing up, suffering the consequences of your actions, figuring out the truth, and taking control of your life. It's unexpected but very appropriate ending will please fans of the series. Cover Comments: As always these covers are just magnificent! I love the dresses, the colors, everything! Read the other books in the series: The Luxe , Rumors , and Envy ! And the boxed set is only $16 ! This books are so pretty. I've only read the first one, but I've plans to finish the series. Also, weren't the dresses the most gorgeous creations! Guest Post from Sarwat Chadda! Guest Blog from Clare Dunkle! Cover Talk: Sweet Venom Reveal! Cover Talk: Heads or Tails? Steal Alert: Awesome E-Books for $2! Come Meet Courtney Allison Moulton! Reading Rants: Time Travel Love! Prom and Prejudice Contest Winners! A True Princess Blog Tour!